A couple walk along the Cactus Forest Trail in Saguaro National Park in Tucson, Ariz., last May. 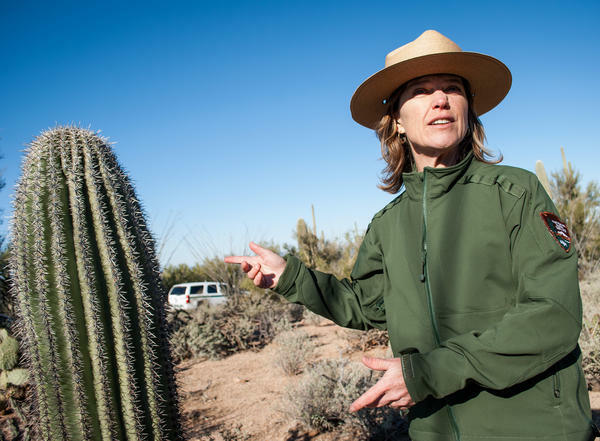 Darla Sidles has been superintendent at Saguaro National Park since 2009. Before, she worked at Independence National Historical Park in Philadelphia, where she says the demographics of the visitors and workforce were far more diverse. She's hoping to mimic that at Saguaro. As Saguaro National Park's new outreach coordinator, Cam Juarez's job is to figure out why more diverse groups aren't visiting the park and what the park can do to change that. To people who aren't interested, it can feel "like selling snake oil," he says. Tucson is only a few miles away from the cacti-lined canyons of Saguaro National Park, but few of its residents make the trip. The park is aiming to change that. Hikers climb past saguaro cacti on Tumamoc Hill, just west of downtown Tucson. The popular hiking path is trafficked by a far more diverse group of people than neighboring Saguaro National Park. 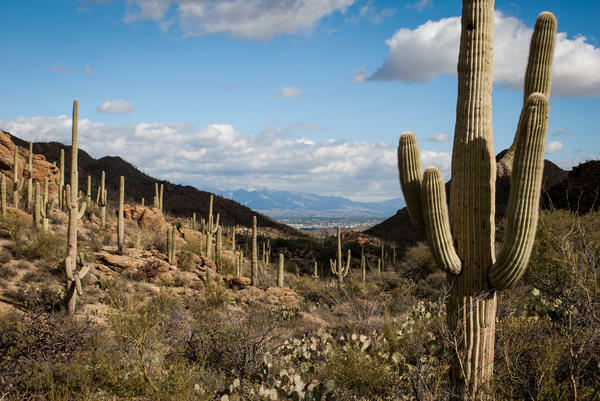 No matter where you are in Tucson, Ariz., you're no more than 20 miles from Saguaro National Park. The park and its tall, pronged, namesake cacti literally surround Tucson. There's the rounded top of the park's cactus-studded Wasson Peak to the west, the park's desert-to-forest Rincon Mountain Range to the east and about a million people living between. 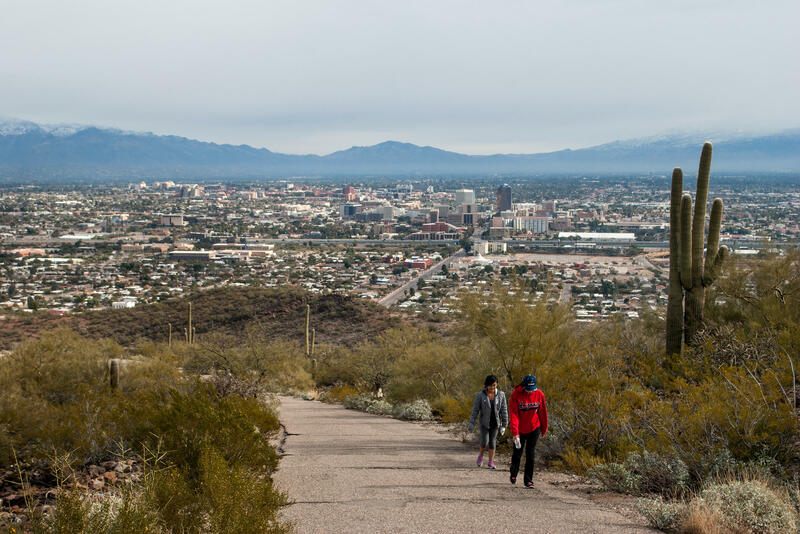 But if you go around Tucson — to its historic barrio neighborhoods, swap meets or hiking trails — and ask people about their neighboring national park, you might be surprised. Darla Sidles, Saguaro National Park's superintendent, is not surprised by those responses. She knows better than most the disconnect that exists between a lot of locals here and the park next door. "The type of people that are coming to the park versus the people just five minutes away in Tucson is really an issue for us here," she says. The reason: The type of people who visit the park don't reflect the type of people living in the community. Tucson is about 44 percent Hispanic or Latino. Of the park's roughly 650,000 annual visitors, less than 2 percent self-identify as Hispanic. "If we're not being relevant to almost half of the population, then 30, 40, 50 years from now, the park isn't going to matter to them," Sidles says. 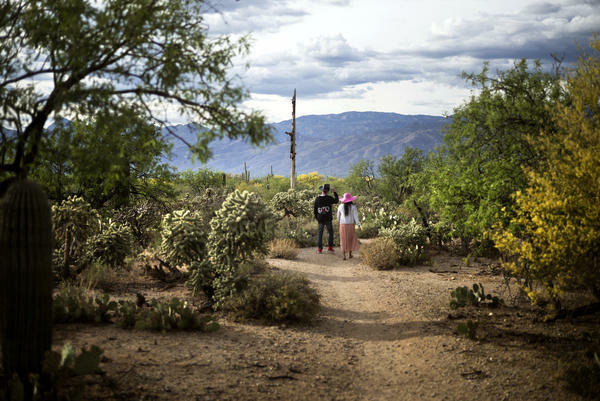 The disconnect between Tucson's minority populations and Saguaro National Park is striking given their proximity, but it's hardly unique. The National Park Service overall has a diversity problem. There were a record 307.2 million visits to U.S. national parks in 2015, and it's fair to say that the majority of those visitors were white. The National Park Service doesn't track the demographics of its visitors, but the most recent survey commissioned by the Park Service to see how different population groups related to the parks found that 9 percent of American visitors were Hispanic. African-Americans accounted for 7 percent. Asian-Americans were 3 percent. Collectively, minorities made up just over 20 percent of the visitors to national parks, despite the fact that they made up nearly 40 percent of the U.S. population. "We know that visitation does not reflect the diversity of the nation," says Jon Jarvis, the director of the National Park Service. "And that's a concern." It's a concern on multiple levels. For one, national parks depend on public money, political support and community engagement for funding. The Census Bureau is projecting that nonwhites will make up the majority of the U.S. population within the next 25 years. Urbanization is growing. And millennials are now the biggest generation in history. Add that all up and it's not hard to predict that multicultural, mostly urban millennials "will assume all seats of power and responsibilities for the nation," Jarvis says. "So connecting to that generation is essential to the Park Service's ability to thrive in our second century." The other reason it's important to connect to all of America's shifting demographics, Jarvis says, is it's the Park Service's job. "The Park Service has a responsibility that Congress and the president have granted us over our history," he says. To that end, Jarvis has made increasing diversity at the national parks a top priority as the Park Service approaches its centennial. His Call to Action plan — a vision for the organization's future — states: "In our second century, we will fully represent our nation's ethnically and culturally diverse communities." Figuring out why there's a disconnect between Tucson's minority groups and Saguaro National Park is about to be Cam Juarez's job. Juarez, from Tucson, is a leader in the Hispanic community serving on the city's school board. In a couple of weeks, he's going to start working for Saguaro National Park as its outreach coordinator. Juarez is getting a jump start on that by visiting a couple of schools in Tucson to ask parents, teachers, administrators and students if they know about Saguaro and, if not, why. He's also going to try to get them interested in the park and what it has to offer. "It's like we're out there selling snake oil," he says on the way to a charter school in south Tucson, which is predominantly Hispanic. "I'd wager to say that there's a whole lot of folks here that don't use the park, close as they are to it." In a way, Juarez is the perfect person for this job because he can relate. To date, he says, he's visited three national parks, including Saguaro. Growing up, his family never went to national parks. They never even talked about it. "It just wasn't something we did," he says. His family was poor. "We didn't have camping gear or fishing gear," he says. "We had hoes and shovels; work implements and school books." 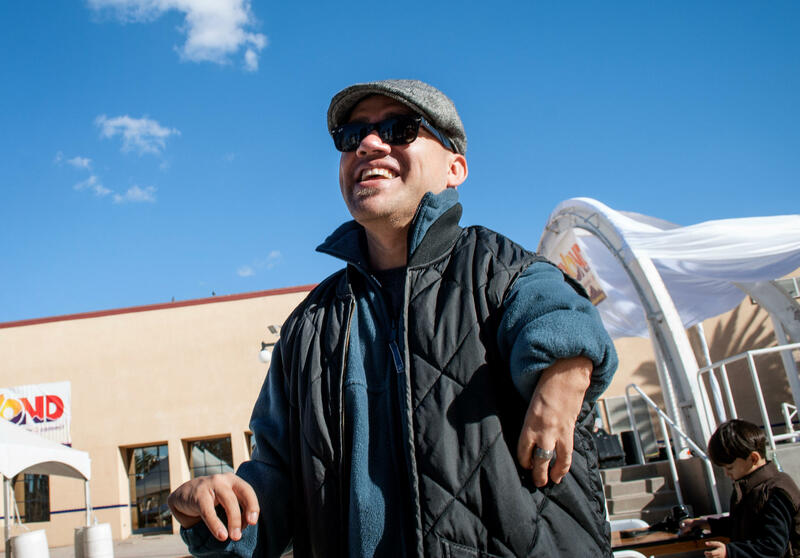 Even as he got older, Juarez says, he thought of national parks as a place for "folks that were white or folks that had resources and sometimes you likened them to each other." Either way, he didn't think the parks were for people like him. He's not alone in that sentiment. That survey of park visitors released in 2011 found that nonwhites were three times more likely to say that parks provide poor service and are not safe places to visit. And Juarez heard some of that at the schools he went to. Oscar Medina, a teacher at Changemaker High School, talked about how he visited a park with his family "and none of the information signs were in Spanish." A mom at Carrillo Intermediate talked about how she wanted to go to Saguaro with her family, but there weren't facilities for a large group. Another pointed out there's no public transportation. Some of the reasons were universal: the cost is prohibitive; not enough time because of work; the lack of shade in a desert park. Others were more subtle. Luis Perales, the chief academic officer at Changemaker High School, says that the reasons minorities, and particularly Latinos, aren't going to national parks is that "spaces either are inviting or are rejecting in many ways. And I think a lot of what's been created [with national parks] is this idea that this is not your space." It's not that Latinos don't want to go outside. Go to any park or hiking trail in Tucson and you'll see that's not the case. It's that they might want to have a different experience in the outdoors. A lot of what the national parks promote is the solitude and quiet of a John Muir photo. "Go out on your own, enjoy nature, don't harm it," Perales says. That messaging of "rugged individualism" doesn't necessarily work with Latinos, Perales says. "It's like no, I'm going to bring my whole family, we're going to be loud, we're going to explore," he says. "That's not what's promoted at this point. It has to be a compromise." There's another reason that people gave for not feeling connected or welcome at the national parks, and it's one that many people danced around. Bella Furr, an intern and temporary worker at Saguaro National Park, had no such qualms: "The other thing is the Park Service is full of white men." That's not entirely accurate, but it's not far off the mark. According to the most recent survey, 80 percent of the Park Service's roughly 22,000 employees are white. Anecdotally, people involved with the Park Service say, the demographics breakdown of the Park Service's estimated 220,000 volunteers is similar. At Saguaro National Park, Sidles estimates about 75 percent of the workforce is white. "We don't have as diverse a staff as we should have," she says. "We have to reflect the face of the people we want to attract." That idea of reflecting the diversity of the public in its workforce is one the National Park Service has been pushing for a long time. Programs have been put in place nationally and initiatives have been launched, but little has changed. That has bred some cynicism about the service's efforts in some quarters. One former longtime National Park Service employee interviewed for this story not-so-jokingly said that the National Park Service could also be celebrating the centennial of its efforts to be more diverse. There are myriad reasons park managers and officials give for the slow rate of change. There's the labyrinthian federal job application system as well as preferential hiring mandates that can keep the resumes of diverse, local candidates off hiring managers' desks. More directly, there's low job turnover and few new opportunities for diverse candidates. With baby boomers nearing retirement, though, that's expected to change and open opportunities for more diversity. Saguaro National Park wants to be ready for that opportunity, and being ready means having young, diverse, experienced candidates for jobs as they come open. That's why they've partnered with the nonprofit group Friends of Saguaro National Park to hire a group of young locals like Yesenia Gamez on temporary contracts. Gamez is what's called a Next Generation Ranger. She works at Saguaro National Park's visitor centers and in its interior, but she also works in Tucson, visiting local schools and working at information stands at local events. On a recent weekend, she showed a big, bleached grizzly bear skull to a group of young kids at a community health event at a park in downtown Tucson. They guessed what animal it was. Gamez says she loves doing events like this because she gets to interact with people who otherwise don't get to experience the park. "People that come to the park are usually retirees who can drive out there," she says. "This is a low socioeconomic thing. It's in the heart of Tucson. It's kind of like we're bringing the park to them." By doing that, she says, the Next Gen Rangers can provide a friendly, familiar face and appeal to people where they're comfortable. They can also tell younger versions of themselves about the opportunities that exist in the National Park Service — if those opportunities exist. As we've mentioned on this program, the National Park Service is turning a hundred this year, celebrating its sweeping vistas and historic buildings. The Park Service is not just basking in the glow of its centennial. To last another 100 years, it will have to overcome some challenges, like how to get all kinds of Americans to visit its attractions. NPR's Nathan Rott has more on the Park Service's diversity problem. UNIDENTIFIED MAN: Saguaro National Park. UNIDENTIFIED WOMAN: I don't know anything about that. Do you? UNIDENTIFIED WOMAN: I don't know. ROTT: Of course many Tucsonans do know about Saguaro. Many visit. But a huge number of people here, especially in certain demographics, feel disconnect. Just ask Saguaro National Park superintendent Darla Sidles. ROTT: The people coming to the park don't reflect the type of people in the community. SIDLES: The demographics here - about 44 percent Hispanic, and meanwhile, Saguaro National Park - we receive maybe 4 percent diverse visitation. ROTT: About half of that are Hispanic or Latino. Put another way, that's nearly a half a million people - almost an entire demographic group - living within view of a national park who aren't connecting to it. Sidles says that has to change. SIDLES: In order, you know, for us to be relevant down the road. ROTT: Now, this is not an issue that's unique to Saguaro National Park. It's everywhere. The National Parks saw a record 307.2 million visits last year, and it's fair to assume that most of those visitors were white. The National Park Service doesn't track the demographics of its visitors. Saguaro did its own study. But the most recent survey on visitation released in 2011 found that fewer than 10 percent of American visitors to national parks were Hispanic. African-Americans were just 7 percent, Asian-Americans 3. And that's despite the fact that those groups made up nearly 40 percent of the country's total population. JONATHAN JARVIS: We know that visitation does not reflect the diversity of the nation, and that's a concern. JARVIS: They will assume all seats of power and responsibilities for the nation. So connecting to that generation is essential to the Park Service's ability to thrive in our second century. ROTT: More importantly, though, he says the Park Service has to connect to young, diverse people and tell everyone's stories because it's their mandated responsibility. JARVIS: And that's our job. ROTT: To that end, Jarvis has made increasing diversity at the National Parks a top priority, figuring out why diverse people aren't coming at the same rates and what the Park Service is doing that keeps them away. Answering those questions is Cam Juarez's job. Juarez is from Tucson. He's a leader in the Hispanic community here, and he recently started working for Saguaro National Park as its outreach coordinator, trying to figure out why the divide between the park and the community exists and how to remedy it. We're doing that now, visiting a couple of area schools where some people don't know about the parks and, frankly, don't really care. CAM JUAREZ: It's like we're out there selling snake oil, almost. ROTT: In a way, Juarez is the perfect person for this job. He never visited national parks as a kid either. JUAREZ: It just wasn't something we did. ROTT: His family was poor, working-class. So growing up, he said he always thought of the national parks as something for rich people or outdoorsy guys. JUAREZ: They have the scruffy beard, you know, the denim shirt, you know, the trucker hat. ROTT: A lot like what I look like right now. ROTT: Basically, Juarez says he thought the parks were meant for white dudes like me. JUAREZ: Hey, guys - digging the mask, Man. LUIS PERALES: Spaces either are inviting or rejecting in many ways. And I think a lot of what's been created is this idea that this is not your space. ROTT: For example, Perales says look at the messaging and mythos around parks and what they offer. PERALES: Like, go out on your own. Enjoy nature. Don't harm it. ROTT: It's the solitude and quiet of a John Muir photo. Perales says that doesn't necessarily work with a lot of Latinos. He's seen it tried in advertisements floated before Latino focus groups. JUAREZ: What's he running from? ROTT: Of course, that's not universal, but we heard a lot of stories like this talking to people in Tucson, stuff like there not being enough picnic tables to accommodate big, extended families at Saguaro National Park, a lack of Spanish translations or pamphlet and signs. But there was also another reason that people gave, one that was most succinctly said by Saguaro National Park intern Bella Furr. BELLA FURR: Well, I mean, the other thing is that the Park Service is full of white men. ROTT: Which doesn't exactly scream diversity welcome. According to the most recent survey, about 80 percent of Park Service employees around the country are white. Here at Saguaro National Park, Superintendent Darla Sidles estimates it's about 75 percent. SIDLES: We don't have as diverse of a staff as we should have. We have to reflect the face of the people that we want to attract. ROTT: Efforts to do that nationally have been around for decades, but little has changed. Federal hiring practices and resistance to change make it difficult to have a workforce that looks like the country. But the bigger issue is low turnover. People just don't leave these jobs. That could be changing soon, though. The Baby Boomer generation is nearing retirement, and Sidles says that presents an opportunity. To take advantage of it, they've partnered with an outside group to hire young, diverse people from the community - so-called next-gen rangers like 21-year-old Yesenia Gamez Valdez. GAMEZ VALDEZ: Can you guess what it is by looking at it? ROTT: Gamez Valdez and her fellow rangers work at the Park Service visitor centers in the field and increasingly in the community, like at this recent health event in downtown Tucson. VALDEZ: I love doing events like this just because you exposed people that are usually not exposed to the park. It's kind of like we're bringing the park to them. ROTT: By doing that and by presenting a relatable face, the hope is that the national parks' visitors and workforce will start to be more representative of the people they serve in the future. Nathan Rott, NPR News, Tucson, Ariz. Transcript provided by NPR, Copyright NPR.